For this very important step I recommend a bar of soap over a liquid hand gel. A great bar of soap must have a fantastic fragrance, and this one: THE BLUEBEARDS REVENGE BIG BLUE BAR OF SOAP FOR BLOKES (175G) is my favourite. With a great fragrance, SLS and Parabens free, Vegan, No animal testing and UK Made, what’s not to like? Your hands will say thank you! If you live in London or Birmingham, you can also get the amazing Glycerine Soap (£1.95) from my favourite shop: MUJI. They are semi-transparent, vegetable based glycerine soaps. 4 scents to choose from including Avocado, Citrus Wood, Lemon and Mandarin. Once a day (when I am home from work) I have to scrub my hands to remove any excess of dirt than has been accumulated all day. This is an extra little help to perfectly clean my hands and to have them absolutely soft and free from any dirt, stains etc…. 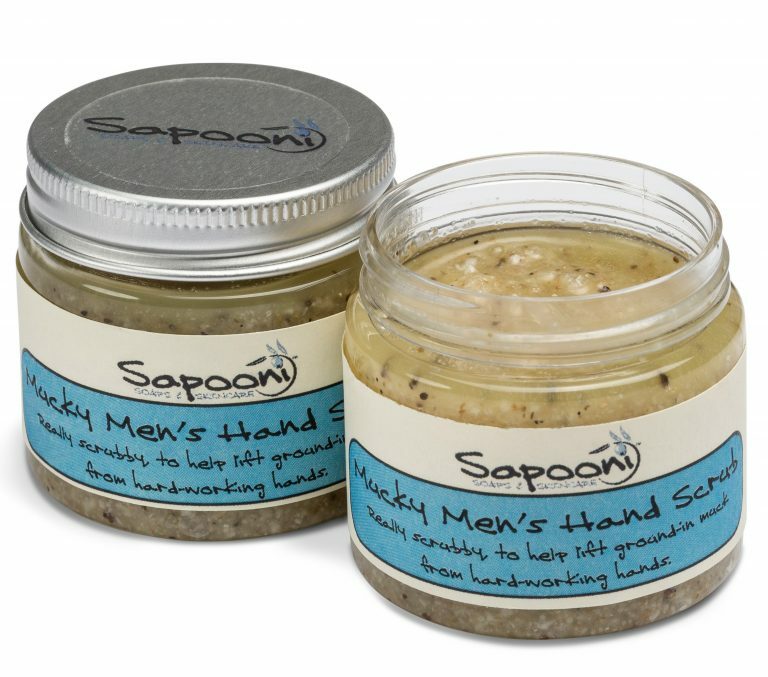 I recommend the Mucky Men’s Hand Scrub from Sapooni, It will gently remove ground-in dirt and stains whilst soothing and moisturising dry, irritated hands. Made with a blend of sea salts (included from Cornwall). To gently lift the dirt, Sapooni uses finely ground natural pumice, ground olive stones, and strawberry seeds. Finally once your hands are perfectly clean and dry it’s time to apply a hand cream. I recommend two very different ones. 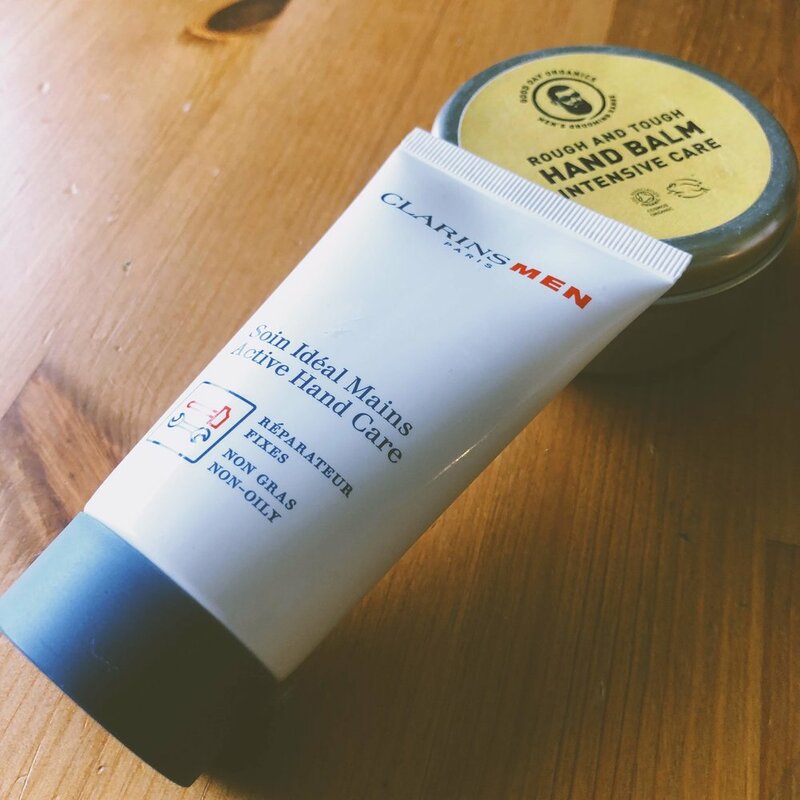 If you work in an office, or stay inside after your hand care routine, I recommend this hand cream from Clarins for Men. I got it has a Christmas present and I am using it daily since! It’s a joy! It is available on Amazon UK. So here you’ve got it, a complete, fast, hand care routine to keep your hands clean, soft and protected especially during the winter months. More posts coming soon and once again thanks for reading! 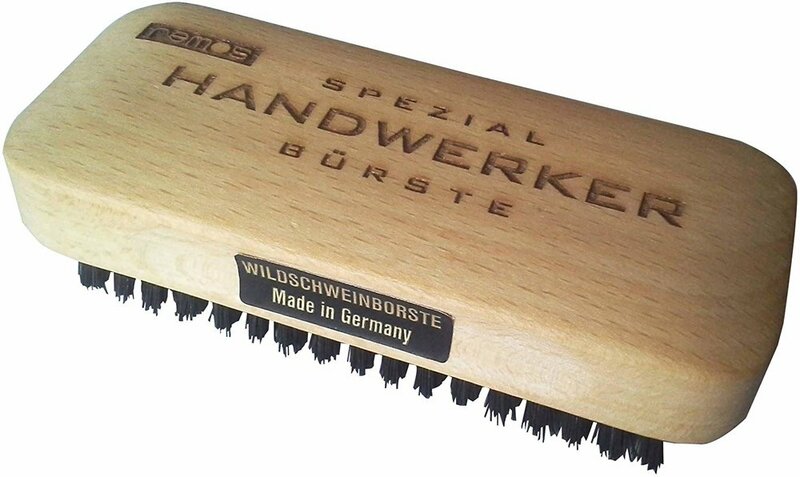 Guys, now you don’t have any excuses for dirty and harsh hands!